You are currently browsing the tag archive for the ‘Ikea’ tag. Hooray! We survived the longest blackout ever. Well it felt like it but it was only 43-44 hrs long. It wasn’t as bad as the big blackout back in 2003 that took out the Northeast. However I do disagree with the Wikipedia post – we went 6 days without power back then, not two. We made the best of the situation at hand by staying indoors with the windows/doors closed to retain what bit of dry cooler air that we had as it was oppressively humid out. And in the evenings, we’d sit out back for as long as possible to maximize the light exposure. We’re very fortunate that we have a gas stove, running water and a pantry full of options that did not need refrigeration. We chose to endure the abundance of idiotic people who thought they were important enough to have to go through the intersections first or better yet, not needing to stop at major cross streets at all that had no working traffic lights just to get to an area that did have power for take out food, drink & basics, relief from the black out, change of scenery, air conditioning and the ability to charge our cell phone’s. Also, if you use cable/VoIP for telephone service, you’d have no access to a phone. If you had a cell phone, you’d be lucky enough to get connected to any cell tower as the local ones were out as well, thus draining your cell battery quicker as it continually had to look for that signal. Luckily for us, we still have an old school land line that always works. We were able to make and receive calls as needed updating family members of our situation and receiving updates as well since we had no other means of what was going on around us. My sister (not affected) was kind enough to call us a few times daily especially since the hydro outage hotline was constantly busy. How do you get through emergencies like this? Do you have everything you want/need on hand? How prepared are you? It’s no secret that we have a Keurig machine – which we love – but slowly, as I continually visit the coffee store to replenish the darling hubster’s supply…I usually take the free box for myself and pick a flavoured coffee. For some reason I find it justified since I wouldn’t normally buy a box of flavoured K-Cups. I have no clue why my logic is this way. So after a few visits, I found myself in a predicament of too many bulky boxes taking up way too much prime real estate in/on our drink station. 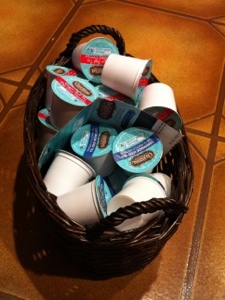 I thought long and hard about how I could organize it and still have easy access to the K-Cups. I also didn’t want to buy anything. After a while, I decided to use these drawer separators from Ikea – tell me who doesn’t love that store – and though it’s unconventional, it totally works. I decided to nest 3 of the smaller containers into a larger one thus making a divided cube. Now keeping in mind that the separators are made of soft nylon, I didn’t want to risk having a rip followed by a K-Cup explosion but the cups seem to be light enough even when it was full of 96 K-Cups. Yes, that’s a lot. The equivalent of 4 x 24ct boxes. Sorry about the mis-matched colours, I used what I had. Close up of the nesting action. Since having the Keurig machine, a friend kindly pointed out that there were these ‘brew over ice’ iced tea cups available but again with my logic…I never bought them. Then WalMart had them on clearance and they were less then $5/box so I figured ‘Why not?’. I had a basket laying around and it was pretty deep so I decided to try to see how many cups I could get in there. To my surprise, I was able to fit both boxes! (regular iced tea & lemon flavoured) Total of 36 cups. Take note my homemade divider…how’s that for crafty? Continuing on with my decluttering/organizing of the drink station, I had to find a spot to put my tea’s – remember, I have a tea hoarding issue? Click here to refresh your memory 😉 Again, using what I already had – this container came from the dollar store many, many, many moons ago. With homemade dividers, I was able to set out a few different flavours instead of forcing myself to drink all of one flavour before moving on to the next. 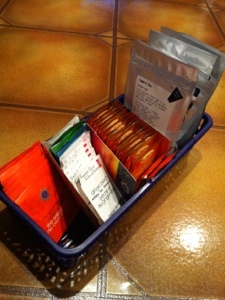 Lastly, we use another tiered stand to house the darling hubster’s stash of K-Cups. He knows where to find them without any confusion as to which flavour it is. ( He despises flavoured coffees.) 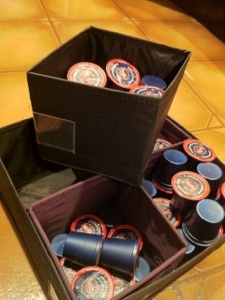 The bonus – its grab and go, no pulling out baskets to grab a cup. What is it about this store that makes everyone go “Oooh!” ? I mean this one store practically sells everything under the sun needed for your home AND they even have an affordable cafeteria style bistro for your dining pleasure which offers hot meals which consists of their famous meatballs with lingonberry sauce to grilled fish and pasta dishes etc. If you’re too much in a rush for a delicious and quick sit down meal, they even have a canteen just across from the check out to tempt/entice you which conveniently sells hot dogs, frozen yoghurt, drinks and their ever so famous – cinnamon buns! Mmmm…..Ok, so back to reality here. I still haven’t figured out what the allure of this store is. Even I will admit, pulling up to the store gets me excited. Walking through their beautifully arranged (and cleverly marketed if you ask me) show rooms & vignettes put me in awe. Such simple design with everything they sell all beautifully laid out. Your mind starts to wander. Almost everyone I’ve ever known simply can not set foot into Ikea without leaving with something that wasn’t on their shopping list – even those friends with such great strength and determination to say NO to a huge slab of chocolate cake sitting in front of them. This store just makes you WANT. And a lot of the time, you’re just buying “stuff”. Now if you’re someone that is great at putting the “stuff” they buy to use, then this store could be great for you. For the most part, I see the masses at the check out buying a lot of lil things and usually there’s a theme to it and then there’s the odd scraggler “stuff” item. Totally an impulse buy. Don’t get me wrong – I. Love. Ikea. I have gone there to buy furniture and housewares etc. I’ve also gone there just for lunch. And yes, I’ve even gone in there to window shop, gather ideas on how I could benefit from having their products in my house thus making it more organized and feel like a “home”. I tell yas, such great marketing! Ikea – they always find a way to get you to part with your money.